This week, another pair of my handknit socks bit the dust. I was a bit bummed about it, because out of the 14 adult-size pairs* I knit last year, only 4 were for myself. Truthfully, I count only 3 pairs because I have yet to wear the Rock & Weave socks. (I still need to sew on the buttons, and they’re anklets, which aren’t ideal wear for Minnesota winters.) The 6th Sense Socks I made with my very first Socks that Rock are still going strong, and I’m thrilled with that. I know handknit socks wear out eventually, but dang, do they have to go so quickly? Most of these socks had been worn this recent fall and winter only, which to me seems an awfully short lifespan. I have plenty of stash yarn to knit all the socks I could ever want. Time is a different story. I never seem to have enough (hence the ‘motto’ you see up there). The Trekking XXL yarn I’m using for the Fluted Banister socks feels very thin. (Is this typical?) Although this yarn does contain nylon to help with longevity, I decided to switch to a US 0 (2mm) after finishing the legs. The resulting fabric is much denser and I hope it wears longer. Another thing I’m considering: knitting a patch of the same slip-stitch reinforcement from traditional heel flaps on the sole near the toe. My socks typically wear out first at the ball of my foot, so that’d be a good place for a counter-measure. Perhaps the next time I knit socks with 100% merino, I’ll try this. After the disappointment of losing another pair of socks, I decided to start a new pair since I only work on the FB while walking. Taking Jeanne’s comment about her experience with Sideways Socks into account, I knit a larger swatch incorporating the different sections of the socks. Already, I could see what she meant�the swatch s-t-r-e-t-c-h-e-d out lengthwise. Ick. Okay, since I was still feeling the urgency for new handknit socks as soon as possible, I started over. Before I knew it, I had knit a new cuff/leg! Do you recognize the pattern I’m using now? *The 14th pair was pre-blog, and can be seen in this gallery. Wonderful mermaids, and that’s is an exceptionally wonderful choice of yarn to use with that pattern. Unbelievably cool! The striping is great. 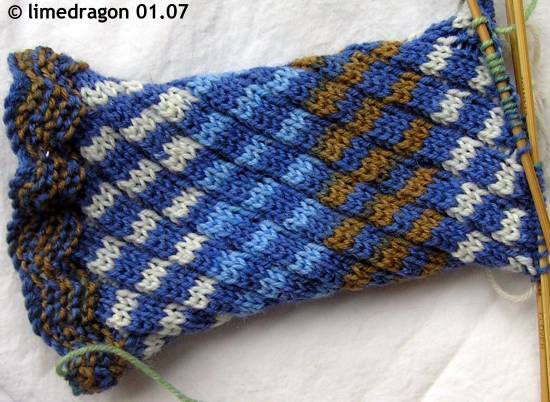 I love the way that pattern looks with striping yarn, but I’ve never knit it. I’ll try it someday. What the striping’s doing on those socks is too cool! The tight twist 100% merinos (like STR)have seemed to wear the longest of the different yarns I’ve used, they’re worn the most too. Do you wear slippers to protect your socks when you’re walking around the house? Carpet is hell on handknit socks. Also, I think the best thing you can do to help improve wear is to knit the socks at as tight a gauge as you can manage. That sock is gorgeous! I don’t have any thoughts on the handknit socks, but I think knitting as tight a gauge as you can seems like a good preventative measure. Wow, I haven’t worn out a handknit pair yet. I must not be too hard on socks though as it takes years to wear out store bought ones too. I have done the slip stitch on the ball of the foot of DH’s socks and that seems to be holding up quite well for him. I hope it helps you. It is indeed sad to say goodbye to the socks so early! I don’t recognize the pattern at all, but I’ve only been knitting socks since last Fall. I do love the pattern tho’. Great socks! I’ve been wanthing to knit that pattern. Thanks again for the gift certificate! I started a pair of Mermaid socks a while ago– love how incredibly simple the pattern is! They look great.